It seems with every movie that Kevin Spacey puts out, he only strengthens the notion that he is one of this generation's greatest actors. And with K-PAX, this is certainly no exception. 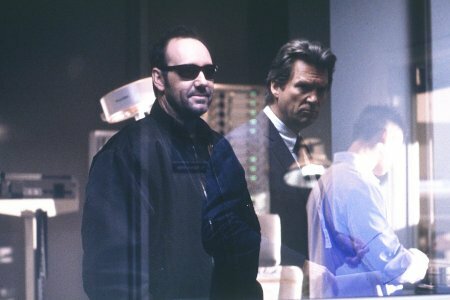 Here he enters the wonderfully ambiguous role of Prot, who is either crazy, or, if you believe his story, he is an alien from the planet, K-PAX. He is discovered in a train station, where the police mistakenly take him into custody for a purse snatching (we see him witness the crime and then try to help the lady just as the police arrive). The police soon realize that this docile man, who refuses to answer their questions or to remove his sunglasses, is not quite all there mentally, so to speak. He is then admitted to a psychiatric institute. 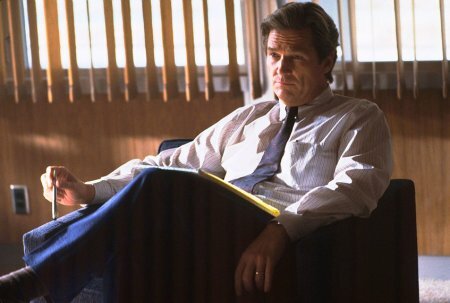 Determined to rescue Prot from his alternative (and outlandish) personality is Dr. Mark Powell (played superbly by Jeff Bridges, of whom I personally am a big fan). Dr. Powell is convinced that Prot is not who he says he is, but is in dire need of help from someone who is willing to listen. And Mark Powell is willing to listen. However, the more time people spend around Prot, the more they are led to believe his extraordinary tales, and the harder Dr. Powell finds it is for him to help this man who calls himself Prot. As the story unfolds, the more convincing Prot becomes, and the more determined Powell becomes. It doesn't take long for Dr. Powell to become quite attached to this new patient of his, and his family continues to suffer from his lack of attention. And so the story goes, and eventually we see that Dr. Powell is also in need of help from Prot, who by the movie's end is able to eventually convince him to spend more time with his family. However, though the pendulum sways from the side of "Prot is an alien" to the side of "Prot is a crazy man," it never seems to settle and we are left wondering, as is Dr. Powell, just who Spacey's character really is. I really enjoyed this film, although I was not blown away by its ambiguity. That doesn't really work on me. It is a movie/story trick which attempts to convince the audience/reader of its own greatness. I could just as easily write a story or make a movie which is equally ambiguous. 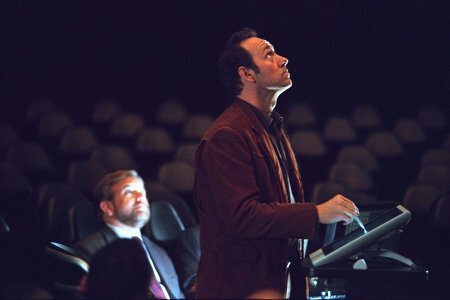 However, what I could never do is turn in a performance like Kevin Spacey does here. It is truly amazing and inspiring to watch. What particularly impressed me were the scenes in which Dr. Powell hypnotized Prot, in an attempt to cure him through regression (that is, for him to open the door to his true self by unlocking his memories from the past). Spacey's face, body, demeanor, and emotion were overwhelming as he uncomfortably recounted horrifying tales from the past of Michael Porter. In the end, we are left wondering. But more importantly, we are left with the moral that our relationships with our family and friends are what are truly important in life. This sort of feel-good story is just what a lot of us need right now, and the intoxicating escape that this movie offers should be a welcome one. Definitely worth seeing for Kevin Spacey's performance and the wonder that he and the story are able to provide. How would you rate the movie K-PAX? There have been 10187 people to visit this page since Wed, Nov 7, 2001. And you are the first person to visit this page today!